Photo: Some of our students seen here enjoying the tranquility of our on-campus vegetable gardens, banana grove, and fishery pond. 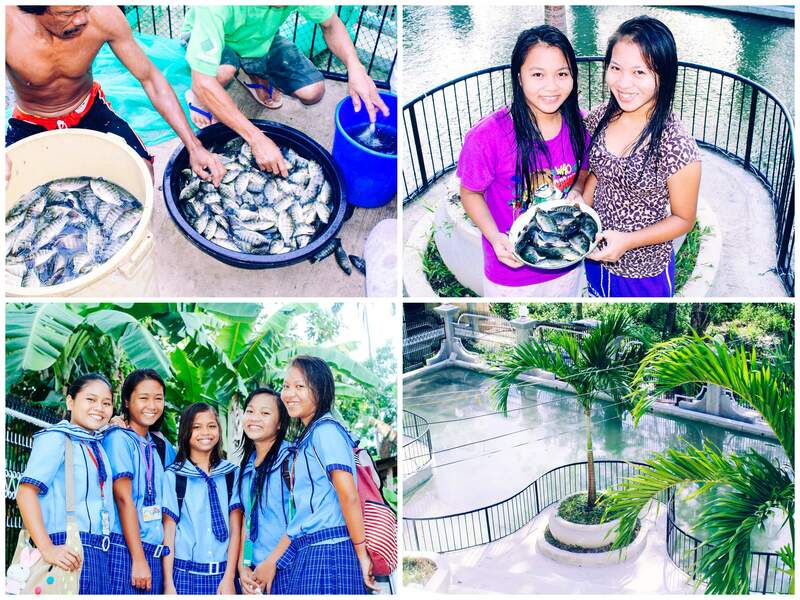 We are happy to report that construction is underway to build a fingerling pond at our fishery on the island of Cebu. This additional, smaller pond will enable our native team to raise the young fish separate from the more mature fish, and feed the young fish the proper food for their health and development. The fingerling pond will be 10 x 40 feet long and 3 feet deep, which will make the harvest of the fingerlings easier for our team to manage — the bigger pond is 6 feet deep. Water for the fishery is continually aerated and supplied with fresh water from a pure aquifer using our own well, reducing the chances of fish contamination to almost nil. Some other advantages of the model are that the fish require less feed than the hens in our hen house project and no medicines, and the fishery is environmentally friendly and low-maintenance. We expect to yield around 6,000 fish at harvest time which will be sold for profit, and will add a delicious and nutritious staple to the diets of our students and others in our children’s outreaches on the island. The profits from our expanded fishery as well as our on-campus vegetable gardens, a hen house that produces over 24 dozen eggs a day, and a banana grove that yields over 6,000 bananas a year are enabling us to extend our programs to the children. All of these agricultural projects are located on our existing campus on Cebu, where our aid to the community includes scholarships and nutritional support for students recovering from child labor or abusive situations, and a weekly outreach to children in various locations around the island. These weekly outreaches usually take place on a Saturday, and average about 100 children in attendance. The program is styled after a VBS day camp feel, but also includes dental hygiene training and distribution of toothbrushes and toothpaste — on the island, 3 out of 4 children suffer from tooth decay by the age of 6. This is part one of a two-part story; within the next two weeks we hope to bring you news of our first harvest at the fishery.